As most readers are aware, we now feature the notes on the ACTIVE SKY page (and others) of the NORTHERN SKIES site. For the purposes of this celebratory year we have a number articles that will appear during the course of the next few weeks to be found on this special SKY NOTES page. 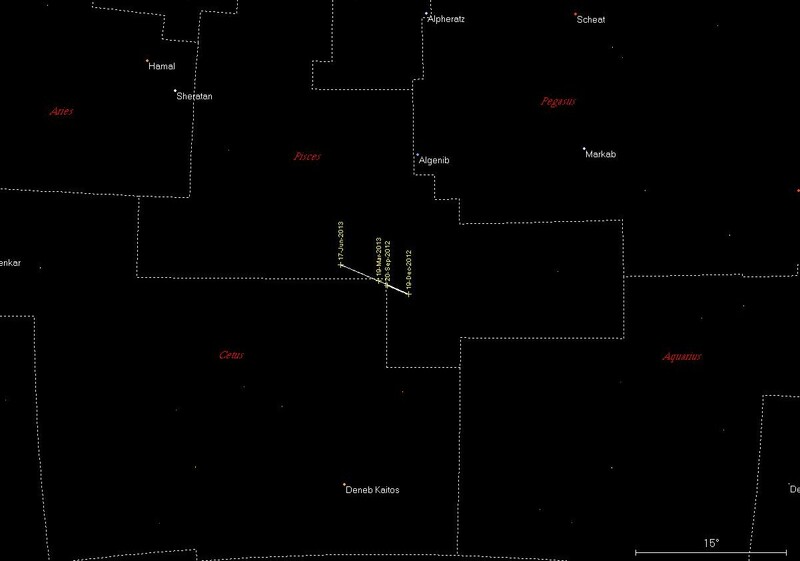 2012 October 16 The Orcadain Sky Notes 10th Anniversary Feature (2) COMETS. Please refer to COMET page. October Skies 2012: JUPITER &VENUS. 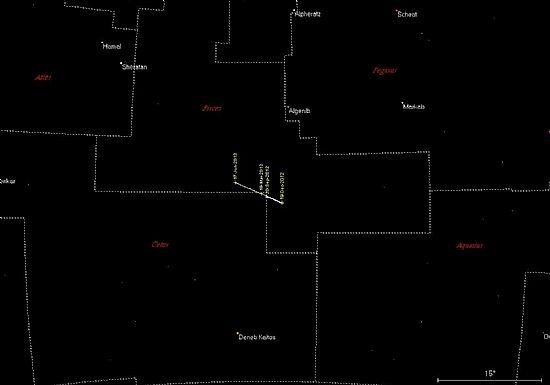 venus continues to dominate the early morning sky for at least two months yet, disappearing from the scene as the year-end approaches. (See: SKY VIEW page.) However, it is imperceptibly fading as the phase increases. Rising at 01h 57m UT on October 1st, 02h 44m UT on the 15th and 03h 41m UT on the 31st of this month. By contrast JUPITER (unmistakable in Taurus not far from the bright, red star Aldebaran – see Sky View page) is slowly increasing in brightness as it approaches opposition in December this year. Rising at 19h 33m UT on October 1st, at 18h 38m UT on the 15th and 17h 42m UT on the 31st. Two of Uranus’s satellites are plainly visible. 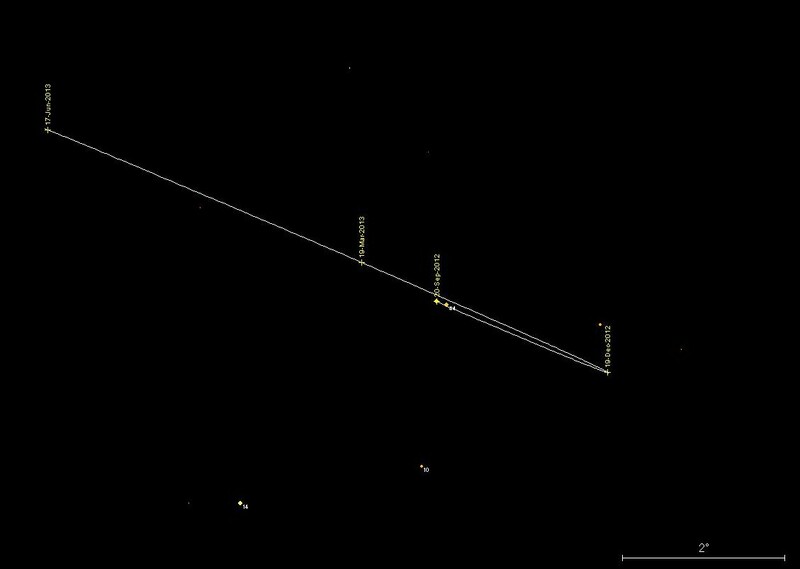 Oberon (13.9) to the right of GSC 3-110 (12.33) and Titania (13.7) below Uranus. 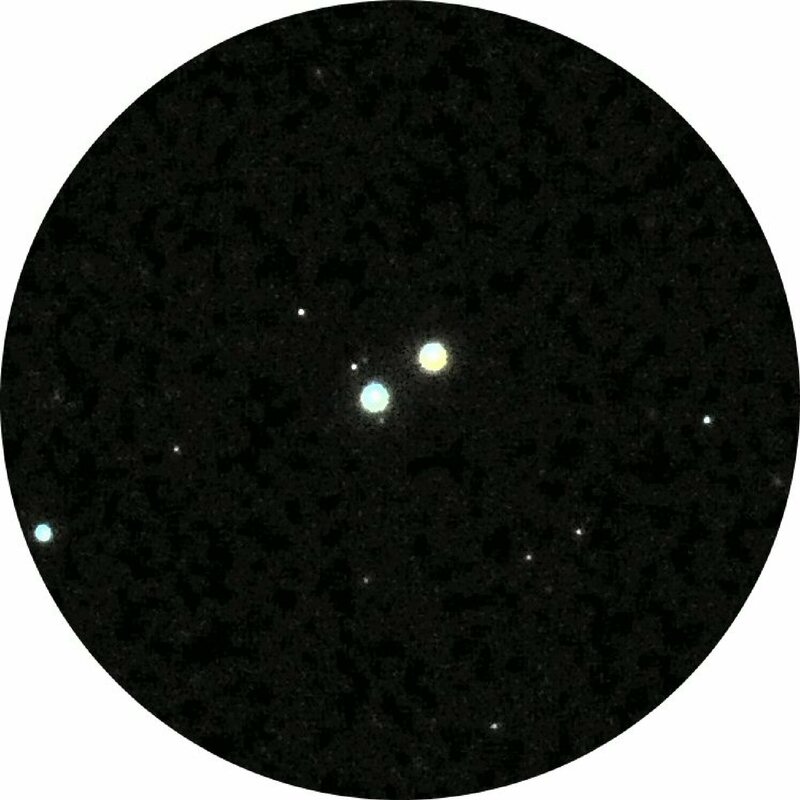 On the original image there is an indication above Uranus of Umbriel (14.8). 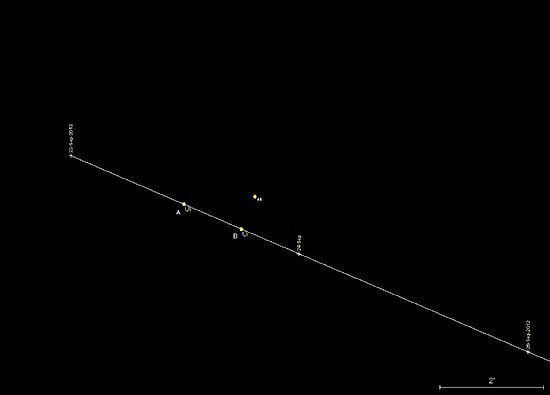 The point to notice is that the satellites appear on a close to vertical line passing through the centre of Uranus itself. This is because the inclination of the planet’s axis to that of its orbital plane is 97°.77, close to a right-angle. 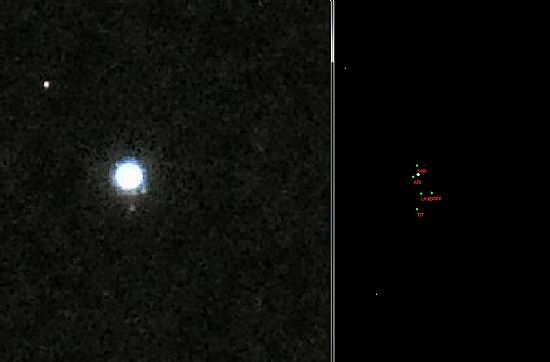 Both Uranus (left) and 44 Piscium (right) are of course excessively over-exposed. The planet and the star should appear of equal brightness. What made this conjunction of special interest? First, the closeness of the approach itself. At the time of observation as recorded on the image shown here, the apparent separation was 82". This is below the resolution capable of the average unaided human eye. In other words, the star and the planet would have appeared as a single, very faint star almost at the threshold of visibility without optical aid in terms of brightness. Closest approach took place in daylight on the next day, 23rd September (position “B” dia. 1). 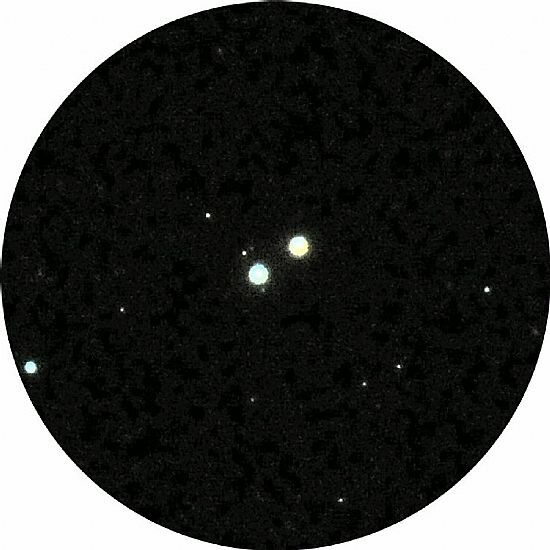 A third consideration is more difficult to quantify and has to do with the probability of such a close approach to a star of similar or even brighter magnitude. 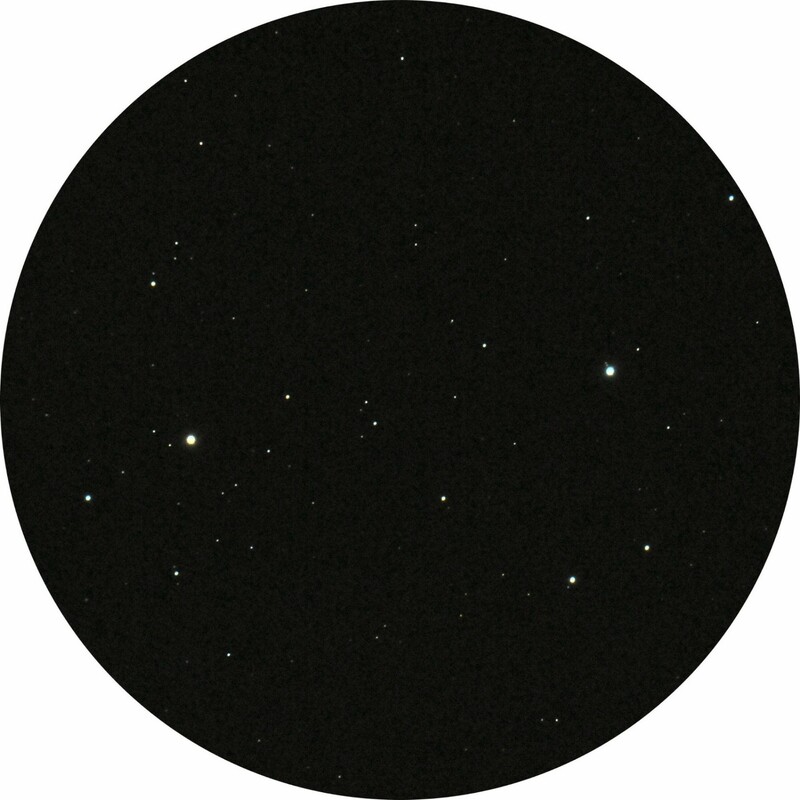 The odds for an occurrence may appear relatively favourable in view of the number of stars in the entire sky at visual magnitude 6 or brighter totalling over 4,000 in number. However, the planets in general (and Uranus in particular) stick pretty closely to the ecliptic throughout their cycle of the heavens. Moreover, the stellar distribution is far from even-handed so that the number of candidates is a great deal below this figure. Looking forward over a period of some 70 years there would appear to be no more than around a dozen stars that are likely to offer anything comparable to the recent conjunction with 44 Piscium. But of course there are other considerations which reduce the chances of observing these events including the one-to-one chance (more or less) that they will occur in daylight hours, not to mention poor weather. I therefore regard my observation of 22 September a pretty rare deal! 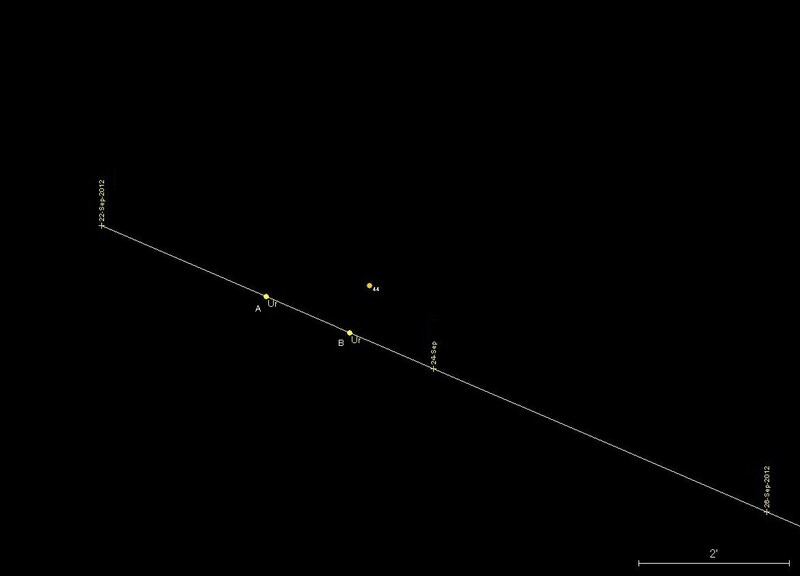 44 Pisc./Uranus separation = 29' 40"
Diagram showing distribution of bright satellites at time of the above observation. Uranus imaged 2012 October 10, 21h 25m UT. 200mm f/8 Ritchey–Chrétien Cassegrain. A 20 sec. exposure. Nikon D300 ISO 1600. Poor transparency, but seeing good for the altitude of Uranus at a little under 19˚. Three satellites visible below the planet (compare diagram to right), the two above may be artifacts caused by terrestrial atmospheric disturbance. Comparisons with images with the smaller aperture apochromatic doublet (120mm f/7.5) on this night would indicate some advantage in quality being given to the latter.